SANTA ROSA, Calif. (August 15, 2018)—The first grapes of the 2018 vintage of Sonoma County’s famed winegrapes were picked today in vineyards throughout the county. At Sangiacomo Family Vineyards, harvest crews converged on a 5-acre vineyard block on Broadway near the town of Sonoma early this morning to begin picking the first grapes of the 2018 harvest. Pinot Noir grapes were being hand-harvested for Gloria Ferrer sparkling wines. Across the street from Sangiacomo in Sonoma, Sasaki Vineyards expect to pick about 20 tons Pinot Noir today, and about 7 more tons tomorrow. The remainder of their 12-acre lot will be picked within 7 days with all the grapes going to Gloria Ferrer and it has for the past 17 years. Up north in Cloverdale, more than 70 tons of Chardonnay grapes were being picked by a crew from Redwood Empire Vineyard Management this morning for Rack and Riddle’s sparkling wine program. 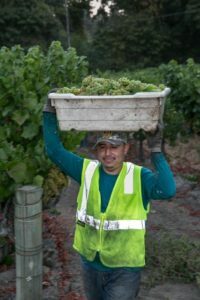 In addition to picking the first grapes of the season, Angelo Sangiacomo of Sangiacomo Family Vineyards, will be presented with an American flag by Congressman Mike Thompson’s office. The flag was flown over the nation’s Capital and is part of the kickoff of the 2018 winegrape harvest.